Lilian Florence Holland was born at Bridgwater in Somerset in 1868, the daughter of William Thomas Holland and his wife nee Florence Du Val (1). She was known within the family as Lily. In 1888 she was married to her cousin Frederic Stanley Kipping, the son of Julia Kipping who, like her mother Florence, was a daughter of Charles Allen Du Val. Frederic Stanley Kipping had first graduated as a zoologist in 1882 but went to Munich to study chemistry with William Henry Perkin junior (2). In 1887 he was appointed Assistant Professor of Chemistry at Heriot-Watt College in Edinburgh. He was elected Fellow of the Royal Society in 1897, and became the first Professor of Chemistry at the University College in Nottingham, where he stayed until his retirement in 1936 (3). When the 1891 Census was taken the family were living at 7 Milborn Grove, Kensington in London, Frederic Kipping then being described as a Teacher of Chemistry. At that time he was chief demonstrator in the Chemistry Department at the Central Technical College of the City and Guilds of London Institute. In 1901 they were at Clumber Road in Nottingham, and Lily Kipping's widowed mother Florence Holland had joined them there. By 1911 however they had moved to 40 Magdala Road in that city. Frederic and Lily Kipping spent many happy years in Nottingham. Their large circle of friends included Professor Ernest Weekley and his wife nee Frieda von Richthofen, after whom the Kippings named a daughter (4). In 1936 Frederic Kipping and Lily, together with their younger daughter, retired to a house on the sea front at Criccieth in North Wales. Frederic Kipping died on 1 May 1949. News of his death reached his academic colleagues on the very day that the first Chancellor of the new University of Nottingham was being inaugurated. Lily Kipping died on 4 September 1949 at Criccieth in North Wales. Among her last wishes was that a genealogical record of the family be made. In a letter to her daughter Frieda she wrote "I feel sure that someone, sometime, may want to write about your aunts and me. It may be a hundred years from now; it may be never. But I should like to think that you and your brothers and sister value our family heritage, and will save some record of it ... just in case someone does concern himself or herself with us and our doings, I'd like to think that something survives" (5). 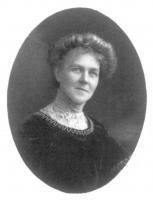 (1) An account of the life of Lilian Florence Holland and her family is given in The Holland Sisters by E.G. Rochow and E. Krahe (2001). This is a semi-fictionalised narrative that has been adversely criticised by William Brock in Chemistry and Industry dated 1 October 2002. But despite its fictional style, the book does but contains some factual information and photographs supplied by Brian Kipping, a descendant of Frederic Stanley Kipping and his wife nee Lilian Florence Holland. (2) Back at the Holland family home in Bridgwater, William Henry Perkin met Lily’s sister Mina Holland, and they married. He and Frederic Stanley Kipping together wrote a textbook on organic chemistry, which went through many editions and was the standard book on the subject at least until the 1950s. (3) A full account of the life and work of Frederic Stanley Kipping is given by Frederick Challenger in the Obituary Notices of Fellows of the Royal Society in the Journal of the Chemical Society (1951) pages 849 to 862. (4) Frieda Weekley later left her husband to live with the novelist D.H. Lawrence, eventually becoming his wife. 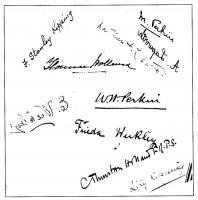 In the illustrated collection of signatures of the three sisters, their husbands and the Weekleys, Arthur Lapworth and Ernest Weekley wrote their signatures as mirror images. (5) The Holland Sisters by E.G. Rochow and E. Krahe (2001) page 179.